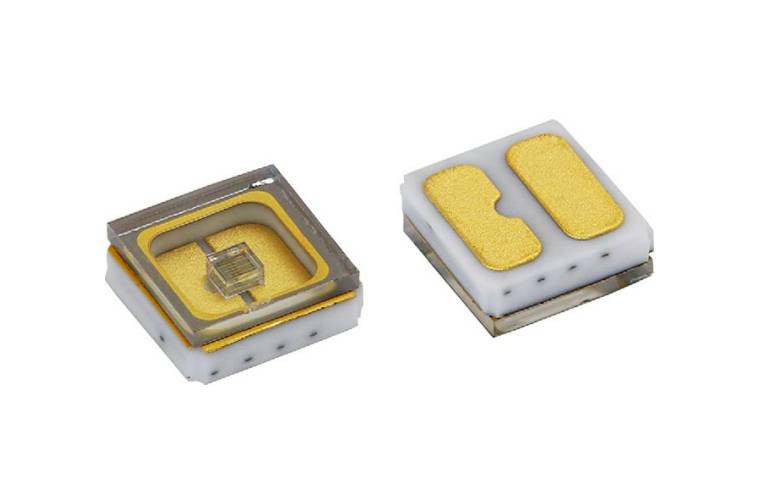 Vishay Intertechnology introduced a ceramic mid power ultraviolet (UVC) emitting diode for sterilization, sanitation, and purification applications. Featuring a quartz window, the VLMU35CM..-280-120 delivers an extremely long lifetime in a compact 3.5 mm by 3.5 mm by 1.2 mm surface-mount package. Designed to replace mercury UVC lamps, the device released today offers an emission angle of ± 60° and radiant power to 18 mW at 100 mA without the need for an external lens. Built on AlGaN technology, the VLMU35CM..-280-120 features forward current up to 150 mA, forward voltage down to 4 V, and a wavelength range of 270 nm to 290 nm. The emitter diode’s specifications make it ideal for water and air purification, physical surface sterilization, medical disinfection, and portable sanitizers. RoHS-compliant, halogen-free, and Vishay Green, the VLMU35CM..-280-120 is compatible with reflow soldering processes and features a Moisture Sensitivity Level of 3 in accordance with J-STD-020. Samples of the new UVC emitting diode are available now. Production quantities are available with lead times of four weeks.